Looking for something to do in the Holidays? Always wanted to try out martial arts or looking to try something different? We're going to kick off with our resident Dietician and Co-ordinator for Martial arts sharing their know how. Our Dietician will go over some handy tips for dealing with food cravings and our Co-ordinator is going to give you some easy ways of tackling those big goals of yours. After that we're going to get active with a guest Speaker giving us a taste of a well known (And famous) martial art: Wing Chun. Here you'll learn some of the ideas and fundamentals giving you a sneak peak behind the curtain. For the rest of the day we're going to go strong on the theme of 'Swords.' (For the 1st of July. 8th may have a different theme) How to handle them, use them and then apply them. By the end of the day you'll be doing multiple person sword work and having a great time too. After our guest speaker you'll be taught sword fundamentals (If you're not a begginer then we'll give you something more to work on) before an afternoon tea break. Then it's on to 'The Real Fruit Ninjer!' Here you're going to get to cut and blast open fruit as you test out what you've just learned on a moving and stationary target. And if you're feeling up to the challenge you can try out our paper cut test. After that we'll swap our swords for something softer as we start teaching you multiple person and team work sword work. From there we go into our big team game. Two teams, everyone has practice padded swords, a big ball and two goals. You're going to put everything that you've learned together. You and your team members will get to go up against the senior students of Phoenix Arts and have an amazing time all the while. We're also going to throw in a free sword video when you purchase your ticket so that we've already got you started even before you arrive. To top it off there's going to be a dinner afterwards and a chance for any Q&A that you might have. So what's included in our Special holiday event at a glance? and only $65 per person per event (Or $110 for a double day entry ticket) otherwise. 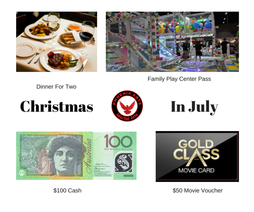 Book Your Place Before the 28th of June and Receive a Ticket into Our $50 Early Bird Entry Cash Prize. Prize Drawn On The Day 01.07.2017. Want to secure your place or have some questions?